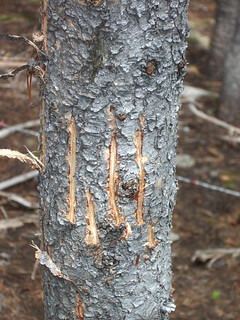 Bear claw marks on a tree near a wire hair snag site. Barbed wire hair snags were used to collect hair samples from grizzly bears throughout the Crown of the Continent Ecosystem as part of the (Northern Divide Grizzly Bear Project. This project used this technique in conjunction with statistical models to estimate the number of grizzly bears inhabiting the ecosystem, which includes Glacier National Park. DNA was extracted from from bear hair collected along survey routes and from systematically positioned hair snag stations. As a result of this project, and after collecting and analyzing a staggering 34,000 hair samples, it was estimated that 765 grizzly bears make their home in the Northern Continental Divide Ecosystem.